Ask a friend if you can be their Writer-in-Residence and stay with them. But not just any friend. This friend needs to be in gainful employment from at least 9am – 5pm. Their routine will force you into one. Relatively cheap apart from copious gifts of thanks. I also recommend unstacking the dishwasher and naming a character after them. The peace and quiet of a domestic setting without the temptation to start sorting out bills or decorating. If you slash your data allowance and ask them not to give you the WiFi password, you can radically cut down on internet distractions. You get to spend a fun evening with a normal human being, smug in the knowledge that you’ve worked all day. Your friend may start to resent that you’re getting to spend more time at their house than they do. Your friend may be tempted to take time off to hang out with you. While undoubtedly fun, try to leave this until the weekend. You are there to write. Many thanks to my wonderful friend and chief beta reader Kate who has volunteered to host me on many an occasion. I’ve heard of writers who take themselves off to a remote holiday cottage to pound out their next book. But I imagine this one-on-one writing retreat would get rather depressing. Cut off from the world, you’d never get a break from work and, I imagine, might go slightly mad. Two years’ ago I walked the 200 miles of England’s Coast to Coast walking route. The sanctuary of a cosy B&B each night was very welcome. These are gems of the British countryside, often run by amazingly knowledgeable and interesting people. Just get in touch and see if they’d be happy to offer a small desk and WiFi during the day. Most B&B owners love to chat about their area. If you’re researching a historical or geographical background, they’ll know all the local experts. Most have WiFi. Or perhaps pick one that doesn’t, so you aren’t distracted. Guest lounges are often deserted during the day, or there may be alternative nooks around to write in. Home-cooked breakfast and a chat guaranteed. Most are within walking distance of a pub or restaurant. Depending on the owners, they might want to chat a little too much. Sometimes the bedrooms are so comfortable it’s easy to regress into holiday mode. If you want to go the whole hog, what about a dedicated writing retreat in a beautiful spot to inspire and refresh? flinging open the gnarled, wooden door in the elegantly crumbling garden wall to reveal the French medieval city of Carcassonne. But it is achievable. 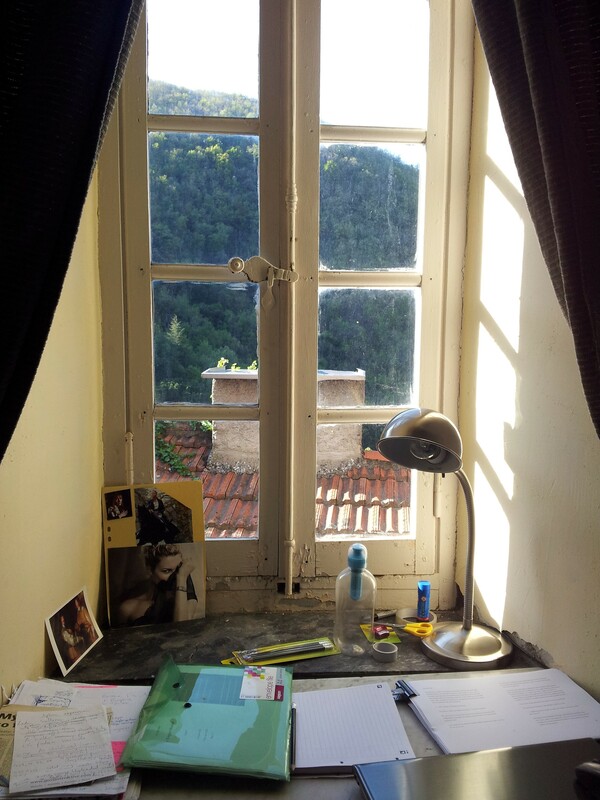 I’ve been lucky enough to visit La Muse Writers’ And Artists’ Retreat in the mountains north of Carcassonne four times now. It has been crucial in turning my book into something ready to present for submission. It’s remote. There are no distractions, not even a shop unless you walk down the valley for 20 minutes. There are amazing walks where you can clear your head. You get to hang out with other authors and artists. Which makes you want to write more as you don’t want to be the one saying you messed about on the internet all day. For me, it felt like being back at university but studying Finishing My Novel instead. The quiet hours rule means that you socialise around meal times, but there are set hours when everyone is supposed to be working. This gives you a routine. There is an amazing library full of favourite books donated by past La Musers. You make friends with other creatives you wouldn’t have met in a million years. I’ve kept in contact with a New York lawyer, a screenwriter from San Francisco and a Welsh poet. The owners Kerry and John are incredibly supportive and have tons of experience and contacts to draw upon. It’s in a remote village which some people might find disconcerting. You have to resist the temptation to just spend all your time reading in the phenomenal library. You really resent having to leave the La Muse bubble. I’m already plotting my return. If you have any questions about La Muse, please get in touch. So what’s your favourite writing retreat solution?